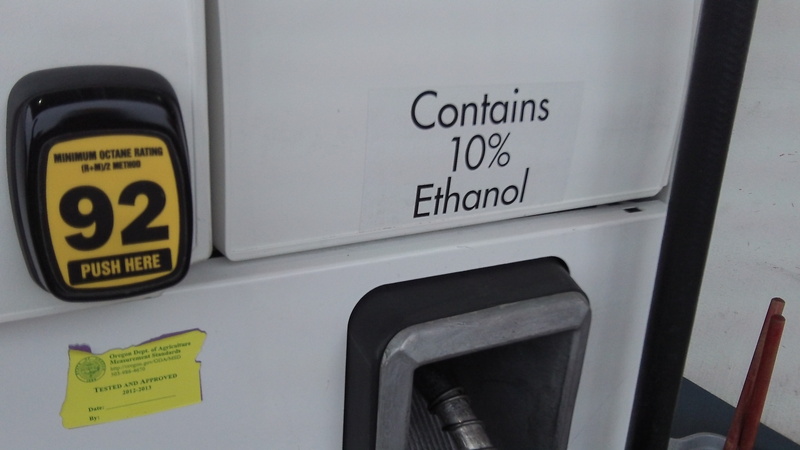 Small print: They don’t exactly trumpet the ethanol content. Now they tell us – about the drawbacks and unforeseen consequences of all that ethanol in our fuel. For years federal and state policy makers and legislators promoted ethanol as the way to cleaner fuel and a greener future. Even though ethanol in this country is made from corn, and the increased demand drives up the price of food. Even though small engines and older vehicles were being damaged by this form of fuel. Now the downside of all that ethanol production is becoming evident even to the national media. The Associated Press reported on Nov. 12 that the ethanol requirement, because of the need for more acreage and more fertilizer to grow corn, has helped ruin parts of the countryside and polluted some of the water supplies in the Midwest. The story also recognized that the production of ethanol requires a large amount of energy from burning oil or coal, calling into question whether it actually saves fossil fuels or reduces the amount of carbon dioxide that our civilization frees up or creates. I have been bugging my legislator for years about this boondoggle. The only people it benefits are those in the production, processing, transportation of ethanol. And don’t forget it cuts down on the mileage we get from our vehicles thus creating more pollution. It also drives up the cost of gasoline at the same time. Like most pie-in-the-sky “green” concepts it doesn’t meet a reality test.